Marius Hansen, COO at Greenbird, and Stein Bergheim, board chairman at Smarthub AS. 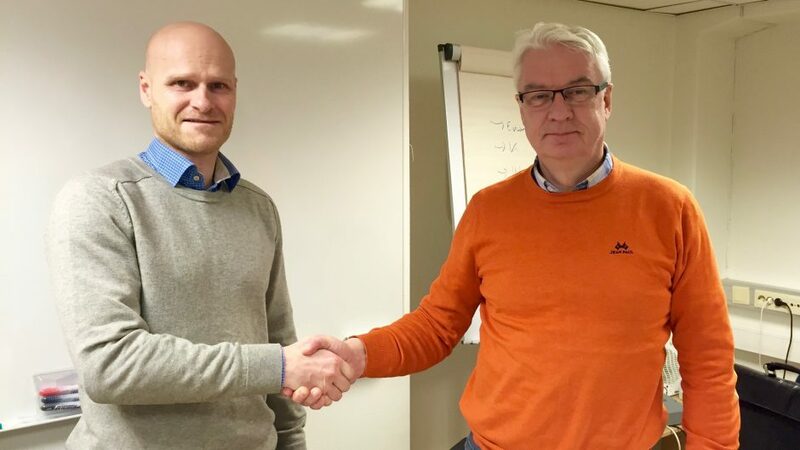 The utility alliance Smarthub AS has signed an agreement with Greenbird for utilizing Metercloud for integration with the Norwegian data hub called Elhub, and the business applications supporting smart metering at the 10 utilities in the alliance . Metercloud will be a future proof solution for Smarthub AS, securing business critical integrations for smart metering, and will enable smart grids through intelligent utilization of large amounts of data. MOLDE/OSLO, January 13, 2016. All utilities in Norway are preparing delivery of consumption data to the Norwegian data hub called Elhub, and the mandatory smart meter rollout which is due by 2019. This will be the foundation for the digital utilities and deploying smart grids. The 10 utilities in the Smarthub alliance will jointly implement and operate the smart meters. Utilizing Metercloud will simplify the interaction with Elhub, and the integration with the business applications at the utilities. Metercloud will enable use of collected data for building intelligent grids. The agreement with Smarthub also includes a subscription on the test and simulation platform Ghostwriter. Smarthub can simulate meter readings and events from more than 150 000 planned smart meters before the actual rollout of the smart meters. – In Smarthub AS, we revealed a need for an integration solution simplifying the interaction between Elhub and the business applications at our 10 utilities in the alliance. We also had a need to simplify the interaction between the Meter Data Management system in Smarthub AS and the business applications at our utilities. In stead of solving integration with a traditional integration project, we realized that Greenbird can offer a more efficient and future proof solution with Metercloud. Now, we are buying an integration as an industry standard. Metercloud offers advantages like lower upfront investments, lower risk, predictable costs, and a solution that is maintained and continuously developed by Greenbird. Metercloud will also be the foundation for securing that Smarthub can enrich and process collected data for realizing the benefits from smart grids, explains Svein Ivar Morsund, general manager at Smarthub AS. Traditional system integration is known to require substantial investments in infrastructure and high cost development projects where all functionality is developed from scratch for every customer. With Metercloud, Greenbird offer an industry standard for utilities solving required integration to support smart metering, smart grids and the transformation of business processes for adapting to Elhub, the Norwegian data hub. Greenbird is planning to certify Metercloud for communication with Elhub. Integration as an industry standard offer advantages like lower upfront costs, lower time to market, lower risk, and better flexibility for launching new and smart services. – Metercloud is based on a state-of-the-art container architecture with open and lightweight components like Apache Camel and Docker. The customers have full flexibility to choose between hosting the solution on a private data center, or a Norwegian or global cloud provider, explains Thorsten Heller, CEO at Greenbird. – In addition, the container architecture in Metercloud will enable extensions for utilizing Big Data and machine learning. The utilities will now have access to large amounts of detailed data about the status in their grids. Metercloud will be the foundation for intelligent operation of the power grids. It will enable utilities to utilize technology and data for predictive maintenance, outage management, self healing grids, and self diagnosis. These technologies will be the foundation for substantial cost savings for the utilities, explains Heller. – We are currently going through a time with tremendous focus on industrial IoT. Greenbird is already approached by customers and partners in the manufacturing and oil industry for utilizing concepts and experiences from the energy industry. The technology in Metercloud has significant potential for launching innovative solutions for new industries, concludes Heller. Smarthub AS is a Norwegian alliance with 10 utilities in the county of Møre and Romsdal. The alliance will collect meter readings from more than 150 000 smart meters. They are responsible for delivering meter readings to Elhub, the Norwegian data hub. Smarthub AS will also be responsible for deploying smart grid technology. This will enable the 10 utilities to utilize large amounts of data from the power grids to improve planning, maintenance, and operation of the power grid.